We're incredibly excited about the sequel and can't wait to share more information on it! The game will initially launch this winter for PC and MAC and while we haven't announced a home console release... Let's just say we've had a great experience with Adventures on home consoles and we'd hate for the first game to get lonely. As to the European release, we have been continuously working on this and it's currently in lot check for both 3DS and Wii U. The fact it's in lot check hopefully means this title's not far away on both Wii U and 3DS. Are any of you in Europe still planning to pick this up? Finally! Question for those who've already played the Wii U version though: does it have classic controller support? In other AVGN related news, his new series of horror movie reviews, Monster Madness begins on Cinemassacre.com today! Sorry to speak it out loud, but this guy is a relict. He used to be an important influence for YouTubers but there are dozens of similar channels that do a better job at his specialty. 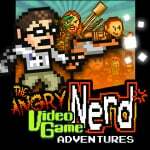 NA will give you AVGN Adventures if you give us your Metroid Zero Mission. @bezerker99 I tried, but the fun police said no. Woo so we've got this and Binding of Isaac coming soon just in time for Afterbirth! @FLUX_CAPACITOR This cracked me up. Also, nope, I don't feel like buying it anymore - not for a good while to say the least. Its time is up and there's too much on my plate now and for the foreseeable future. Really hoping this one will make it to Germany. :/ Still more and more games that won't come here specifically. Maybe Australia too? I hope so. Otherwise it'd be a (insert Angry Joe profanity segment here). I'm not too sure about this game but think I'll get it anyway, looks fun. Doesn't matter. I enjoy his videos because of what he does. And if those other similar channels were actually better, they would have gotten their own game too. They don't. @OddworldCrash Pretty much. 2010 was his peak, then it went all downhill from there. The freakzone games are pretty good.